A Transport that communicates on a stream-oriented Unix domain socket. Definition at line 43 of file unix-stream-transport.hpp. Definition at line 33 of file unix-stream-transport.cpp. 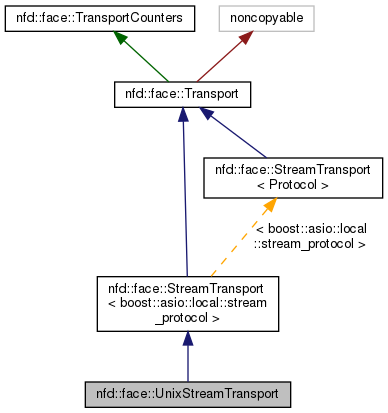 References ndn::nfd::FACE_PERSISTENCY_ON_DEMAND, ndn::nfd::FACE_SCOPE_LOCAL, ndn::FaceUri::fromFd(), ndn::nfd::LINK_TYPE_POINT_TO_POINT, nfd::face::StreamTransport< boost::asio::local::stream_protocol >::m_socket, nfd::face::MTU_UNLIMITED, NFD_LOG_FACE_INFO, nfd::face::Transport::setLinkType(), nfd::face::Transport::setLocalUri(), nfd::face::Transport::setMtu(), nfd::face::Transport::setPersistency(), nfd::face::Transport::setRemoteUri(), and nfd::face::Transport::setScope().